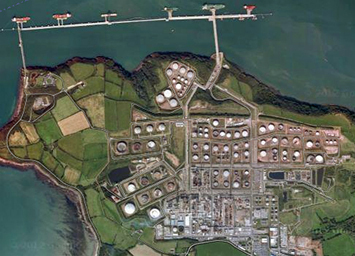 Valero Energy Ltd's Pembroke Refinery is situated on the Pembrokeshire coast in Wales, UK. The oil refinery first came on stream in 1964, with the fluid catalytic cracking unit coming on stream in 1982. The refinery also has an HF Alkylation unit, catalytic reforming unit and three hydrotreating units. Pembroke refinery has the capability of refining acid crude oils such as Captain and Doba crudes. The refining capacity is 10.5 million tonnes per year and the product output is gasoline, diesel, kerosene & jet fuel, fuel oil and LPG petrochemical feedstocks. The crude oil terminal is capable of handling tankers of 275,000 tonnes deadweight. Products are distributed mainly by sea (90%), road and pipeline which connects to the Midlands and Manchester. As the oil industry changes in the current economic climate with the need to make downstream more competitive, it becomes increasingly important to consider higher productivity and higher product quality. Of course safe operation is always the number one priority. Valero's Pembroke refinery carefully studied the functionality of Exapilot and implemented an application on the Butane Driers. There are two sets of driers, the first one for water content removal and the second for hydrogen removal. The driers are regenerated through an operator-activated regeneration sequence. More than 50 valves are located around the driers and an operator has to carefully follow a sequence to regenerate them. 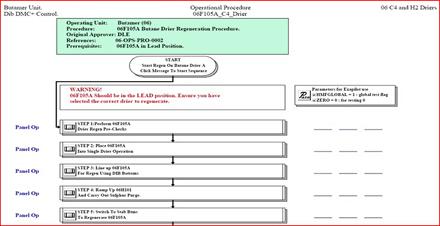 A lot of complicated procedures are needed based on the operational conditions. Regeneration of these driers is a very important process to purify the butane gas product. 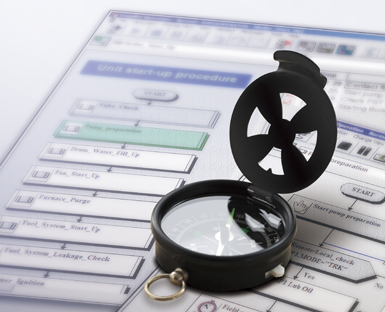 The Exapilot program automatically controls the valve alignment throughout the entire regeneration cycle and places the driers in the correct positions after regeneration. The procedure includes a critical sequence of opening and closing valves. Failure to correctly isolate a regenerating drier may result in leaks or explosions caused by hydrogen pressure build-up. Exapilot aids procedure management at Valero's Pembroke refinery. When the sulphur recovery plant is shut down by the emergency shutdown system (ESD), operators have to carefully start up the plant using a complex recovery procedure, which can be time consuming. Exapilot will help Valero successfully execute any start ups of the sulphur recovery plant in the event of an emergency shutdown. The following benefits are brought to the operation.